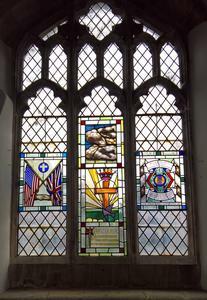 Three-light stained glass window with images depicted in each light. Left hand light : Union Flag and Stars and Stripes above two hands in handshake. Centre light : Three BA7 Bombers. Beneath is a cross with crown above a dove. Right hand light : Crest / badge of 401st. Bombardment Group. 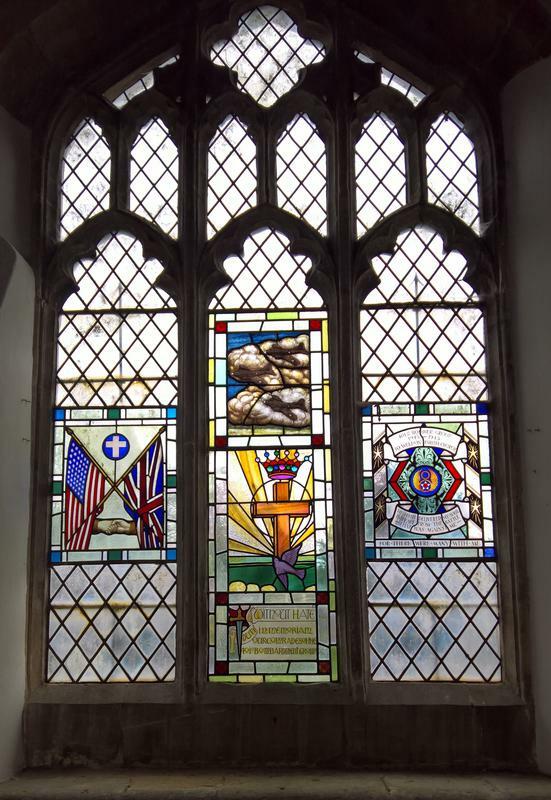 CENTRE LIGHT : DUTY WITHOUT HATE / IN MEMORIAM / OUR COMRADES OF THE / 401ST BOMBARDMENT RIGHT HAND LIGHT : 401ST BOMBER GROUP / 1939-1945 / TO WELDON PARISH CHURCH / "HE HATH DELIVERED MY SOUL / IN PEACE FROM THE BATTLE / THAT WAS AGAINST ME / FOR THERE WERE MANY WITH ME"